We are excited to start the Humane Society of Sheboygan County Pet of the Week!! To kick us off is 11-year-old cat Jinx who has been at the shelter for over 160 days! He might be a “senior cat”, but Jinx has an amazing youthful spirit. He adores basking in a patch of sunshine, likes laps and loves some snuggling. This handsome guy is a BIG fish lover, especially crab & tilapia. So if you’re looking to share a Friday night Fish Fry, then he’s your man. 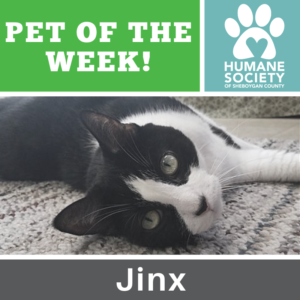 Find out more about Jinx here.